Canoose Camps Check in time can be arranged in advance. All accommodations are base on daily rates. 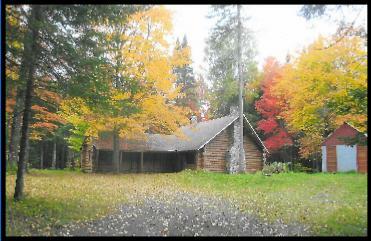 Departure 10:00 a.m.
Canoose Camps and Lodge is NON SMOKING and NO PETS. We do not accept credit cards for payments, security purposes only. Cancellations. Amount is transferable to another person who has not already reserved accommodations. This hand crafted Scandinavian Scribed Log Lodge is 24' x30' 50' and contains 5 rooms, the great room and 4 lower level bedrooms We also have two cabins designed for four people each. 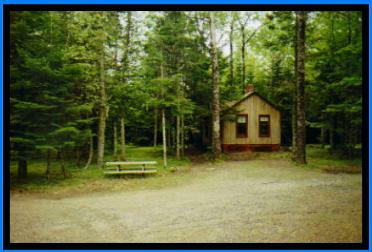 Housed in a separate building are the washrooms & showers facilities with lots of hot water. Our buildings use solar power as there is no hydro. We have no telephone at the lodge by choice. If you need to make a call, your cellular will work from the lodge provided you have a high power type. Canoose Camps Check in time can be arranged in advance. All accommodations are base on daily rates. For your convenience and comfort, the lodge has 4 bunks in each of the two rooms in the L portion. In the rooms off the Great Room 2 single beds in each of the two rooms. There are no kitchen facilities. The cabins sleep 4 in bunks. No kitchen facilities. Picnic tables are provided for your BBQ and propane stove convenience.